Stainless steel instruments – even when new – typically contain micro-sized scratches that will cause composite material to stick to the instrument, making placement difficult and tedious. Combining original concepts of Dr. Ronald Jordan (that dramatically changed direct restorative esthetics) with advanced material, the Dr. Ronald Jordan Composite Instrument Series provides enhanced handling, no material pull back, and perfect placement. Made of proprietary stainless steel and coated in non-porous Titanium Nitride, the instrument tips provide strength, flexibility, and a non-stick, smooth surface that allows for easy composite placement. 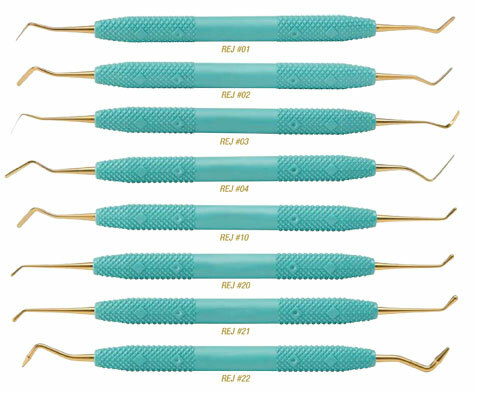 All eight of the Dr. Ronald Jordan Composite instrument Series feature oversized, contoured handles made of non-slip Radel, so they’ll perform predicatably with gloved hands, and will not discolour. The larger handle size is more comfortable, provides enhanced tactile control, and alleviates hand and muscle fatigue during longer procedures. Used individually or as a set, the Dr. Ronald Jordan Composite instrument Series will dramatically enhance your efficiency in posterior and anterior restorations. Superior flexibility makes this perfect for labial, lingual, and gingival sculpting. This instrument features both a "hockey stick" shaped blade as well as a "beaver tail" shaped blade which allows for the placement of material in a more delicate manner. Designed for initial labial compaction and sculpting, the blades of the REJ #02 are slightly longer and wider than those of the REJ #01. While not designed for fine detailing, the blades are perfect for initial increment shaping. An excellent choice for working interproximally or for packing retraction cord. The thin, highly flexible blade reaches under margins to hone and sculpt. It is also perfect when you need to delicately place composite in any critical location. Designed for interproximal shaping. It is ideal for shaping composites and the embrasure areas of diastema closure restorations. A highly flexible instrument, the REJ #04 is not designed for packing composites. Features a paddle end and a condenser end and is specifically designed for condensing into box preparations and carrying syringe material to the preparation site. The REJ #10 blade is slightly longer and wider than the REJ #02 blade. It is also excellent for contouring. A double-ended condenser, this instrument is perfect for condensing material in all box form preparations, and if you apply composite via compule. The instrument features two sizes of condenser (large and small) to facilitate macro and micro packing techniques. This is a double-ended condenser. Often after the composite has been inserted into the tooth, a change in instruments is required as the width of the cavity changes from the depth of the box into an extension of one of the fissures. Having this instrument on hand eliminates the need to search for another separate instrument. Designed for use on occlusal anatomy, the rounded ends of the REJ #22 are ideal for sculpting composites and for pulling excess composite away from the cavo surface margin. Its pointed ends allow for delicate shaping of the inclines. Important: Due to the thin and flexible nature of REJ #03 and REJ #04, ultrasonic sterilization of these instruments is not recommended. When using a protective cassette, do not heat above 350ºF/176ºC. Sterilize only with devices of a similar metal content and wash with a non-corrosive, low sudsing, neutral detergent. PLEASE NOTE: Once instruments are opened, they cannot be returned. Click the button below to add the Dr. Ronald Jordan Composite Instrument Series* to your wish list.